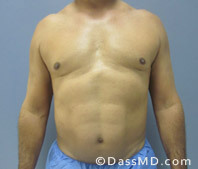 This young man had excess fat on the abdomen and love handles that was unresponsive to exercise. Liposuction of the abdomen, flanks, and back. By reducing the love handles he looks much slimmer and more athletic. Smart Lipo of the abdomen and love handles. This male actor needed a slimmer abdomen and waist for his work.